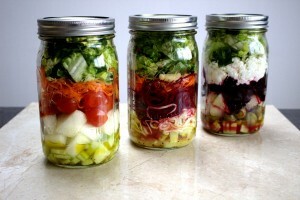 Mason jar salads are nothing new and I certainly can’t claim that they were my idea. I have been looking at pretty mason jar salads on Pinterest for a long time and when my wonderful husband bought me some mason jars for Christmas I was so excited to try them. There isn’t a whole lot to them – although there are a few rules to avoid having a soggy mess on your hands. 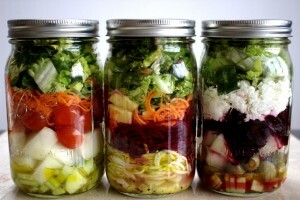 The best thing about mason jars salads is being able to prepare a few salads in advance on a Sunday night. Plus, they just look so pretty in your fridge. I always bring my lunch to work. Being on the Specific Carbohydrate Diet (SCD) means I don’t have the option of just grabbing a sandwich like everyone else. It is time consuming to have to prepare every meal and so being able to prepare three or four salads on Sundays can be a life-saver. Unless I am going to eat the salad the next day, I don’t put in any meat or tuna and just stick to vegetables and fruit. Basically, the same safe food rules apply with regards to how long different foods will stay fresh in the fridge. When it comes to creating the perfect mason jar salad a few fundamental rules are as follows: the dressing always goes at the bottom and the lettuce and other leaves always go at the top. The layers in between are up to you but I try to keep the harder vegetables (i.e. the ones I don’t mind getting a little soggy) next to the dressing. Prepare all your salad ingredients – a good tip to mix it up is to chop some, grate others and spiralize others. Don’t be limited to just vegetables, I like to add some fruit too. My favourite is melon as it keeps really well. Don’t put in ingredients that will brown quickly. I’m looking at you, AVOCADO. Just add this to your salad when you are ready to eat. Even dressed with lime juice and salt, I find it still browns slightly. Layer 1: (Salad dressing) 4 tablespoons extra virgin olive oil, 1 tablespoon apple cider vinegar, 2 teaspoons raw honey, salt and pepper. Mix all the ingredients in a glass and add to the end of the mason jar. Layer 1: (Salad dressing) 4 tablespoons extra virgin olive oil, 1/2 teaspoon Dijon mustard, 2 teaspoons raw honey, salt and pepper. Mix all the ingredients in a glass and add to the end of the mason jar. 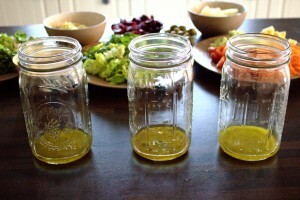 Layer 1: (Salad dressing) 4 tablespoons extra virgin olive oil, 2 teaspoons raw honey, 2 tablespoons of fresh lemon juice, salt and pepper. Mix all the ingredients in a glass and add to the end of the mason jar. Layer 6: Dry curd cottage cheese (available in Polish shops in Ireland and the UK, called “Twarog”. Make sure to get the red packet which is the full fat version). When the weather gets a bit better, we usually head out for a road trip every Sunday and take a picnic with us. 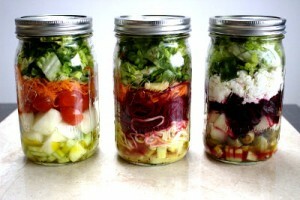 This year, I’m looking forward to bringing Mason Jar Salads with us. In the past, we used to have to bring about 20 different ramekins with all our salad ingredients so they wouldn’t make each other soggy. Problem solved! Hi Sean, I don’t actually sell the Mason Jars but I can put you in contact with a supplier, if you are based in Ireland?